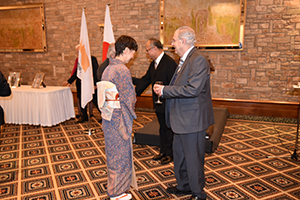 In his capacity as Honorary Consul-General of Japan in Limassol, Andreas Neocleous, chairman of our firm, joined Mr Masuo Nisibayashi, the Ambassador of Japan in Greece, to host the annual reception for the Birthday of His Majesty The Emperor of Japan at the Hilton hotel in Nicosia on 5 December 2016. 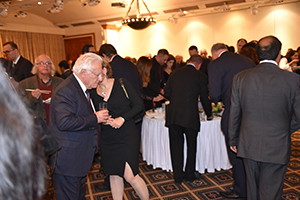 The reception was attended by more than 140 guests, including leading politicians and business people, ambassadors and representatives of other overseas countries. 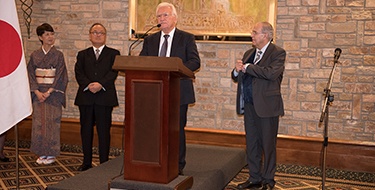 In his speech welcoming the guests Mr Neocleous paid tribute to the goodwill that exists between Japan and Cyprus, and between Japan and Europe as a whole, and praised the recent initiatives such as the Japan-EU Free Trade Agreement negotiations that will further improve collaboration and investment. 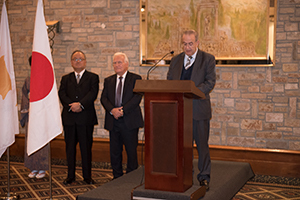 We should like to extend our sincere thanks to the Embassy of Japan in Athens for its excellent organisation and we look forward to the next reception in a year’s time.